This just in: Kentucky has grabbed another offensive rebound. Sorry, couldn't resist. The Alabama men's basketball team will look to rebound (heh heh) Wednesday night when they travel to Auburn to play the league-leading Tigers. Alabama enters this game with an 8-6 conference record, while the War Eagles enter with an 11-3 record. Game time is 7:30 P.M. CT. SEC Network will televise the game. Click the links for team and KenPom stats. My Two Cents: I'll give credit where it's due, and the Auburn fans have packed out games this season, turning that arena into a tough place to play. DJC remarked in his Kentucky recap that he was envious of the Kentucky crowds. I'm envious of the environment Auburn has had on a consistent basis. I'm envious that their students are given prime seating that allows them to have a direct impact on the game. Whether Bruce Pearl remains the coach at Auburn in the wake of the FBI investigation and subsequent NCAA investigation, or whether Auburn remains relevant in college basketball, the decision makers at UA have to take a long look at the facility improvements at long-time basketball doormats like Auburn and Ole Miss and realize that the current state of affairs at Coleman isn't going to cut it. There's a lot of rumors blowing in the wind about facility upgrades for basketball that will be announced in the offseason. I hope it turns out to be more than just another band-aid for Coleman because if Ole Miss and Auburn can build awesome new venues for their basketball programs, surely the University of Alabama can produce a better basketball environment for students, faculty and fans. That said, Alabama will likely enter a very loud environment on Wednesday night. Not only is it Alabama vs Auburn, but the Iron Bowl trophy will change hands (even though the Iron Bowl really meant nothing this season heh heh haha haha heh hahah....ahem...where was I?). Alabama has already beaten this Auburn team once, but much worse Auburn teams than this one have made life difficult for Alabama teams down there in the past. It will take a tremendous effort for our guys to get out of there with the win and season sweep. You'll notice I didn't write "impossible". That's because Auburn lost more than the game this past Saturday at South Carolina. Anfernee McLemore, arguably the team's best interior player, who led the team in blocks and was top 3 nationally in block percentage, was lost for the season after a leg injury. McLemore was an emerging player for this team on both ends, and I believe his loss will impact this team. For starters, his loss leaves Auburn with only eight available scholarship players on the roster, and one less interior player for a team that wasn't big to begin with. Then again, no one expected Auburn to be as good as they have been so perhaps this team finds a way to overcome another road block. 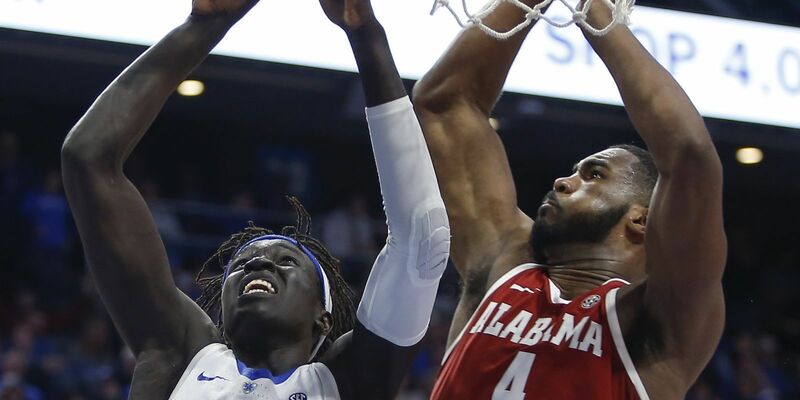 Regardless, Alabama will have a size advantage on Wednesday night that they need to exploit on the glass as well as driving the ball to the basket with Auburn's best rim protector unavailable. Players to Watch: We've discussed Collin Sexton's competitiveness before. It shows up in how hard he plays on both ends, his cheering for his teammates when he's on the bench, but it also manifests itself in trash talk. Collin likes to talk trash to opposing players and fans. He's the type of guy with an edge that every program needs if it's going to win games it shouldn't like Wednesday night. While the environment at Auburn would be intimidating to most, it could be the type of environment that a competitor like Collin thrives in. If he's playing his A game on Wednesday night, he and the Auburn student section are going to just love each other. I feel that in my first Auburn preview I didn't give enough respect to the guards for Auburn. They're the motor of this team, and their improvement across the board has played a big role in this resurgence for the program in Pearl's fourth season at the helm. These days in basketball, if you have great guards you can go a long way. Auburn has three great ones in Jared Harper (13.5 ppg, 39.7% from 3, 5.8 apg, 1.1 spg), Bryce Brown (16.4 ppg, 40.5% from 3), and Mustapha Heron (16.1 ppg, 5.4 rpg, 1.2 spg). Heron is a physical force that can score anywhere on the floor, Brown is one of the best shooters in the league, and Harper is the mastermind of it all, running the team at an extremely efficient level (157 assists vs 58 turnovers). The scary thing if you're not an Auburn fan is that all three of these guys could be back next season. In the first game, our guys did a great job defending all three, holding them to a combined 27 points, 4 assists and 9 turnovers. It will take a similar defensive effort on Wednesday night.